Spray 13x9-inch (3-quart) glass baking dish with nonstick cooking spray. Layer half of bread cubes and half of cheese in sprayed baking dish. Repeat with remaining bread and cheese. Beat eggs in large bowl. Add milk, mustard and salt; beat well. Pour over bread and cheese in baking dish, pushing bread into milk mixture to moisten completely. Cover; refrigerate 8 hours or overnight. To serve, heat oven to 350°F. Uncover baking dish; bake at 350°F. for 35 to 40 minutes or until knife inserted in center comes out clean. Meanwhile, in medium nonmetal bowl, combine all salsa ingredients; mix well. Let egg bake stand 5 minutes before serving. To serve, cut into squares. Serve with salsa. Egg bakes like this one are perfect for assembling the day before. Just cover tightly and refrigerate overnight. Then, bake shortly before serving. The strawberry salsa will be best if prepared shortly before serving. Always refrigerate leftovers immediately. Reheat individual servings, loosely covered, in the microwave on HIGH for 1 to 2 minutes. 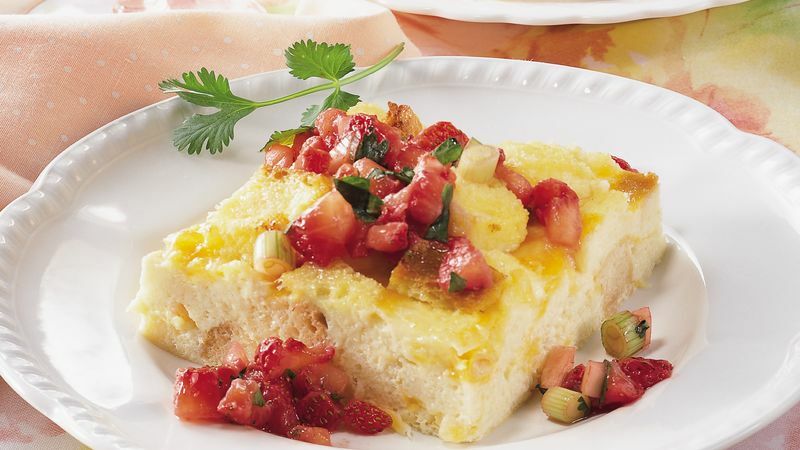 Served plain, the mild flavor of this egg bake appeals to kids. Let them decorate their pieces with sliced olives for eyes and aerosol snack cheese topping for the mouth.